Laparoscopic Roux-en-Y gastric bypass (LRYGB) is the most common bariatric surgical procedure performed in the United States. 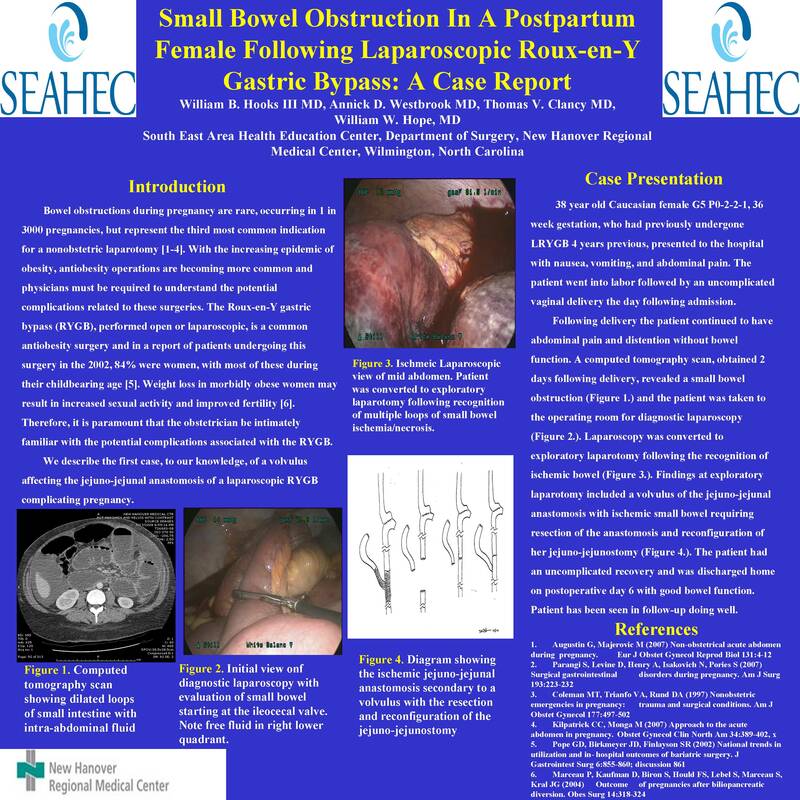 Small bowel obstruction following LRYGB is a common complication often caused by adhesions, internal hernias, or obstruction at the gastrojejunal or jejuno-jejunal anastomosis. We present a case report of a 38 year old Caucasian female, 36 week gestation, who had previously undergone LRYGB 4 years previous. She was admitted with nausea, vomiting, and abdominal pain. The patient went into labor followed by an uncomplicated vaginal delivery the day following admission. She continued to have abdominal pain and distention without bowel function. A computed tomography scan revealed a small bowel obstruction and the patient was taken to the operating room for diagnostic laparoscopy. Laparoscopy was converted to exploratory laparotomy following the recognition of ischemic bowel. Findings at exploratory laparotomy included a volvulus of the jejuno-jejunal anastomosis with ischemic small bowel requiring resection of the anastomosis and reconfiguration of her jejuno-jejunostomy. The patient had an uncomplicated recovery and was discharged home on postoperative day 6 with good bowel function. Bowel obstruction following vaginal delivery is rare entity with few reported cases. Displacement of abdominal viscera by a gravid uterus may be an inciting event for bowel obstructions in patients that have undergone LRYGB. This case highlights the need for the general surgeon and obstetrician’s familiarity with bariatric surgery operations and their complications.